Today’s post is different and on the serious side so I’ll get straight to the point: pregnancy loss. It’s a subject that I feel very strongly about since I’ve survived multiple miscarriages, but in no way am I looking for sympathy, nor am I telling women who have lost a baby to speak up. I know that pretty much everything I share on this blog is cute and fun but as well as Breast Cancer and Domestic Violence Awareness, October is Pregnancy Loss and Infant Death Awareness month and I wanted to acknowledge that. It seems sometimes like it’s “easier” to discuss or share topics like suicide, sexual assault, and cancer but for some reason miscarriage is something we don’t really talk about. Not too long ago Mark Zuckerberg made a status update on Priscilla’s past miscarriages and touched on the issue of not talking about it with others. I wanted to share the status or maybe comment but felt a little too vulnerable at the time, so I didn’t. It feels like talking about miscarriages makes people uncomfortable, they don’t know what to say or they say the wrong things so most often people don’t even know that someone has had a miscarriage – this is basically the reason women don’t announce their pregnancy until after three months, in case there is a loss. Sadly, miscarriage can and does happen after that three month threshold. 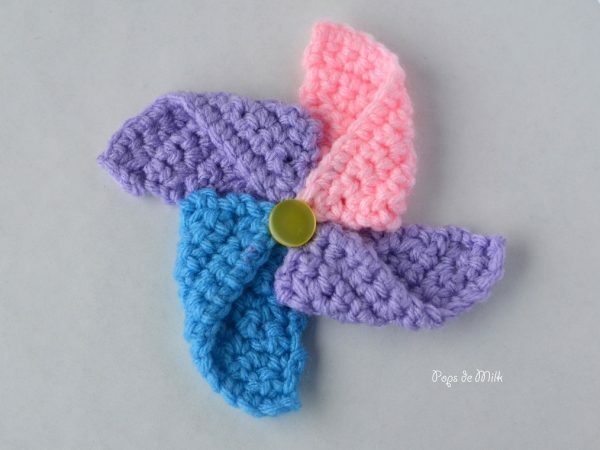 Inspired by pinwheels for PAIL (Pregnancy and Infant Loss), I have created this pinwheel pattern hoping to spread awareness and give others a semblance of comfort. If you’ve suffered a loss, know that you’re not alone and even if you don’t believe it (yet) things do get better. -Assume the grieving mother will accept invitations to baby showers and birthdays or think that bringing your child to visit will cheer them up. -Ask if they will try again. -Let them know you are there, nothing else, just there if they need you. -Recognize they were a mother/father. -Share your own loss story. -Acknowledge there was a baby. If you’re interested in donating or learning more you can check out Canada Helps or PAIL Network. 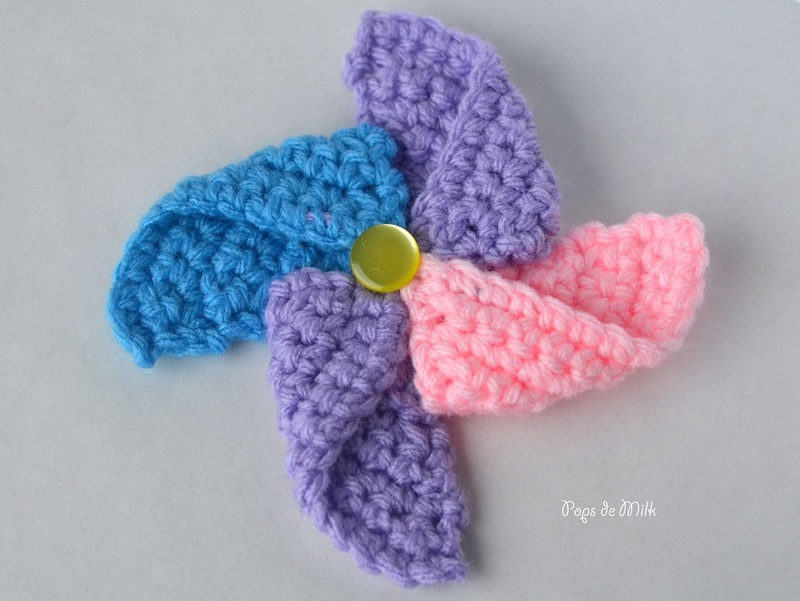 Optional – wooden stick to attach your pinwheel OR attach a pin and wear the pinwheel as a brooch. 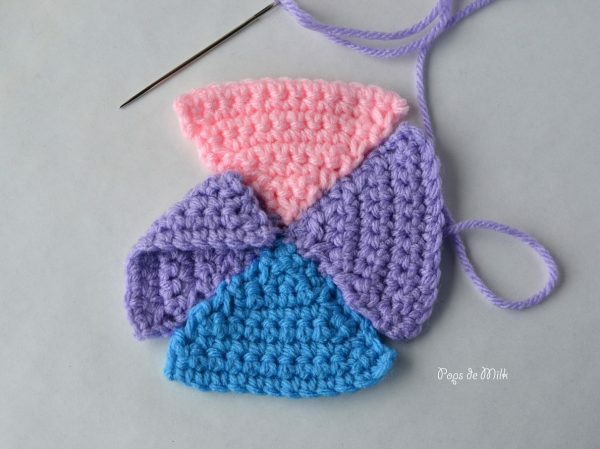 Make 2 triangles in purple, 1 in pink, and 1 in blue. Row 1: ch 14, sc in 2nd ch from hook and each ch across, turn. Row 2: ch 1, dec, sc across, dec in last 2 sts, turn. Row 3: ch 1, sc across, turn. Rows 4-7: repeat row 2. Row 8: ch 1, dec in all 3 sts, ch 1. 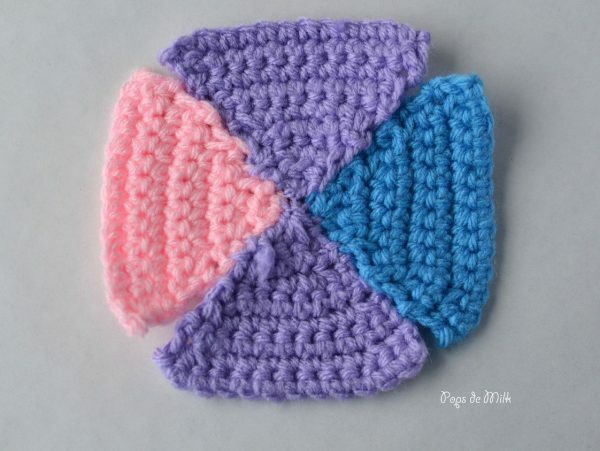 Fasten off and weave ends for the blue, pink, and one of the purple triangles. 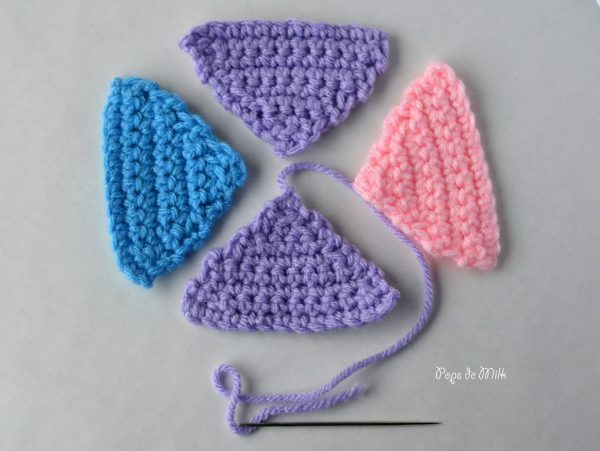 For the second purple triangle leave a long tail for sewing. Form a square with the triangle pieces and starting from the centre, join each triangle side about a third of the way up. Repeat until all triangles are sewn together. Next fold the top corners down and sew to middle. 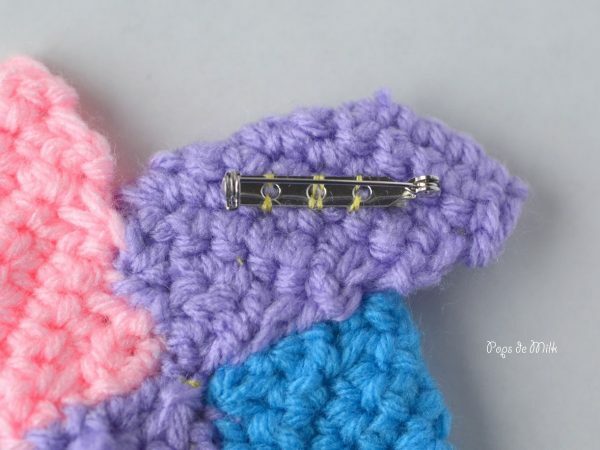 Finish by sewing a button in the centre. Beautiful and important post, thanks for sharing!